Canon Europe, BSI Meetings & Events and Banks Sadler were among the event planners that attended London City Selection’s annual fam event at the weekend. The Barbican-led initiative hosted a weekend of time travelling-themed activities for 24 event planners. Delegates were divided into teams and tasked with winning ‘money’ by visiting member venues in the City. London City Selection (LCS) chair Samme Allen said the event, which hosted its first corporate buyer this year – Canon Europe senior European events & hospitality professional Pascalle Mulder, would run as two annual events in the future for agencies and corporates respectively. 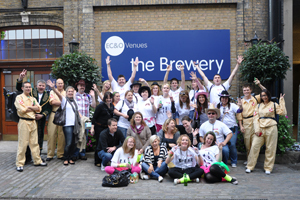 Banks Sadler account co-ordinator Jenny Eppler said: "The weekend was both fun and informative with the right balance." The consortium’s portfolio increased by five venues since its decision to request accreditation through AIM for its members in May. Allen said: "The London Stock Exchange won business within a month of joining LCS." LCS now has more than 20 members including venues and hotels including City Inn and Gibson Hall.